Preheat grill for 10-15 minutes, on medium to high heat. To make garlic herb sauce: sauté sliced onion in 1 tablespoon of butter with fennel over medium heat until onions are translucent. Add 1 tablespoon of flour and stir until coated with butter. Add milk, basil, oregano, garlic, crushed red pepper, and salt and pepper to taste. Bring to a boil while stirring. Lower heat to keep at a simmer and stir constantly until thickened. Brush a dash of olive oil on each side of the crust. Grill crust 2 – 4 minutes on each side. Remove from grill. In a bowl, mix grilled chicken, spinach, sun-dried tomatoes, grilled red peppers, and salt and pepper. Spread garlic herb sauce on crust. Add cheese, then top with chicken and vegetable mixture. 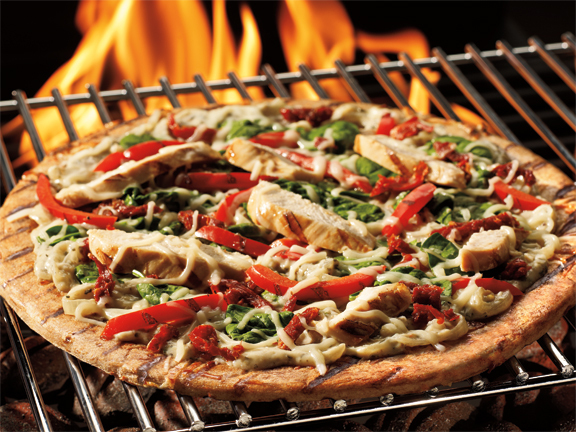 Place pizza back on grill to warm for 8 – 10 minutes or until cheese is melted. Slice and serve.